To accurately calculate property value, there are eight numbers you need to know. Learn how to properly evaluate your next investment by following six property value estimator steps. Using the income method approach can help simplify the tricky process of evaluating multi-family properties. Any investor knows that performing their own property value estimations is a crucial aspect of making smart investment decisions. Making use of a good property value estimator, whether it be your own system or an online tool, can help minimize confusion and errors that occur too often when making complex financial calculations. Below you will find a discussion of several approaches to calculating property value, including step-by-step guides on how to make those calculations. Read on to identify the best property value estimator for your investing niche. Mortgage Payment: A mortgage payment is the monthly payment made to the lender against the property loan. A portion of the payment will help pay off the original loan principal, whereas the other portion is interest paid to the lender. The mortgage payment may or may not include property taxes and insurance. Down Payment: A down payment is an initial cash payment that represents a percentage of the property’s total purchase price. Although homebuyers who take out a Federal Housing Administration (FHA) loan or plan to occupy the property can put down as low as 3.5 percent, most investors should expect to make a down payment around 20 to 25 percent of the purchase price. Rental Income: Investors often utilize a projection of rental income in order to qualify for a mortgage loan. A rental income that covers more than just the monthly mortgage payment will be viewed as less risky by the lender, and can result in better loan terms. Price to Income Ratio: The price to income ratio is a popular housing affordability measure. The ratio compares the median household price and median household income in a given area. Housing becomes more affordable as the ratio decreases. Price to Rent Ratio: To find the price to rent ratio, divide the median home price by the median annual rent in a given area. The ratio measures the relative affordability of renting versus buying in a given housing market. Investors should avoid investing in markets with high ratios, such as 20 or above, as it signals a market that is more favorable for renters. Gross Rental Yield: The gross rental yield provides investors with the annual income generated by a property, measured against the total purchase price. To find the gross rental yield, find the total rental income for one year, also known as the rent roll, divided by the total purchase cost for the property, including closing costs, fees, and any renovation costs. Shown as a percentage, a higher rental yield signifies a better investment. Capitalization Rate: The capitalization rate takes the gross rental yield a step further by taking the operating expenses for a property into account. To find the capitalization rate, tally up the total expenses for a property, including repair costs, taxes, insurance, fees, and any vacancy costs. Take the annual rental income and subtract the total expenses (calculated above), and then divide the resulting number by the total property cost. The capitalization rate will often be called the cap rate for short, and is also referred to as the net rental yield. Cash Flow: Cash flow, often measured on a monthly or annual basis, measures the net income generated by a property, after netting out any expenses and mortgage payments from rental income. Cash flow is positive if there is a remaining balance after all expenses and payments for that specific property are made. Conversely, a negative cash flow is a result of the rental income not being enough to cover the owner’s expenses for that specific property. Investors should always avoid properties with a projected negative cash flow. Identify the property’s fair market value: Generally, a property will sell at its fair market value (FMV) in an open market. In other words, it is the negotiated price between what a fully informed buyer is willing to offer, and what a seller is willing to accept. To find this value, compare other properties in the area that were recently sold that are comparable in size, age and condition. Calculate the replacement cost: How much would it cost to build an exact replica of the property at hand? The process of calculating a value by the means of answering this question is called the replacement cost method. This includes the purchase price of land, the cost of labor and materials, but not including any depreciation. This method is useful when it is difficult to identify comparable properties. Project the potential rental income: If the property at hand is currently an income property, contact the current owners and ask how much they charge for rent. This would also be a good opportunity to ask for a list of monthly expenses, as well as the reason for which they are selling the property. If there are no current owners, or they are not willing to provide data, reach out to local rental management companies and inquire about comparable data in the area. Estimate the annual net operating income (NOI): The net operating income is calculated by taking the total amount of income produced by a property and deducting all operating expenses, such as insurances and property taxes, maintenance, repairs, and management fees. Because expenses can fluctuate from month to month, investors should be aware that the annual NOI is an estimate. Calculate the Capitalization Rate: The capitalization rate, or cap rate for short, can be calculated by taking the property’s total purchase price or market price and dividing it by the net operating income (NOI) estimated above. Some investors will argue that the cap rate is the most important measure for comparing property values because it forces investors to project all possible expenses in detail, allowing them to accurately find the best value. Calculate the cash on cash return if a mortgage payment is applicable: If a mortgage payment is required, it will first need to be factored in as an expense in the net operating income calculation above. After this is done, divide the annual NOI by the total cost of the down payment and any repairs made before the property can be rented out. This will result in a percentage that represents how much the property will earn relative to the amount of money that was invested. From a real estate perspective, a rental property’s value can be compared with similar properties that have recently sold in the neighborhood. However, this valuation does not take into account the income component. In the case of calculating property value based on rental income, investors can make use of the gross rental multiplier (GRM), which measures the property’s value relative to its rental income. To calculate, simply divide the property price by the annual rental income. Discussed earlier, the capitalization rate is a key metric used by investors because it takes into consideration the costs incurred when owning a rental property. To find the cap rate, first find the net operating income (NOI) by subtracting all operating expenses, including vacancies, from the annual rental income. Next, divide the resulting figure by the price of the property, which results in the capitalization rate. Both the cap rate and the GRM can then be utilized as benchmarks when evaluating at comparable income properties. What Is Multifamily Real Estate? Multifamily real estate is commonly thought of as apartment complexes, which can host more than one space to be rented out. There are a multitude of strategies when it comes to real estate investing, but when narrowed down to the category of residential real estate, there are two main types of properties: single-family and multifamily. As one might assume, single-family properties are designed to fit the dwelling needs of up to one family. Mentioned above, multifamily real estate comes into play when a property provides more than one rentable unit. Investors may choose to pursue the multifamily real estate investing niche due to the unique advantages it has to offer. The income method approach is widely agreed upon as the best way to analyze the value of a multifamily property. This method utilizes the net operating income (NOI) and the capitalization price of the property. Estimate the property’s net operating income (NOI): A property’s NOI is estimated by deducting all operating expenses from the total income produced by the property in one year. The investment property evaluation section above provides a detailed explanation of how to arrive at the NOI. Calculate the capitalization rate using the NOI: Now take the property’s purchase or market price and divide it by the NOI calculated in the step above. Multiply the resulting number by 100 to find the capitalization, or cap, rate. The concept of the capitalization rate was visited in detail in previous sections. Arrive at the multifamily property value: Once the property NOI and cap rate are calculated, the property value can be determined relatively easily. Simply divide the NOI by the cap rate to arrive at the multifamily property value. Based on these calculations, investors should realize the importance of accurately estimating the property’s total operating expenses, which affect the resulting NOI, cap rate, and property value calculations. Figuring out the current market value of a multi-unit property can be tricky, so most investors choose to borrow from the income method approach discussed above. To estimate the current market price of the property, simply divide the net operating income by the capitalization rate. For example, if the net operating income was $100,000 with a capitalization rate of five percent, the property value would be roughly $2 million. However, note that a property’s net operating income and capitalization rate can fluctuate from month to month, so this is figure is an estimate at best. Investors can also choose to perform a local market comparison of similar multi-family properties in the area, or calculate the price via the replacement method approach discussed earlier. It should be apparent by now that there are several approaches to calculating property value, with each method requiring a working knowledge of key measures and calculations. Even the most seasoned property value estimator may feel challenged when making complex calculations while keeping track of measures that fluctuate over time. Luckily, investors can utilize an investment property value calculator found online. It is best practice to develop an understanding of how to calculate property value based on rental income, or using cap rate to calculate property value, but there is no reason not to make use of helpful tools that are made available. 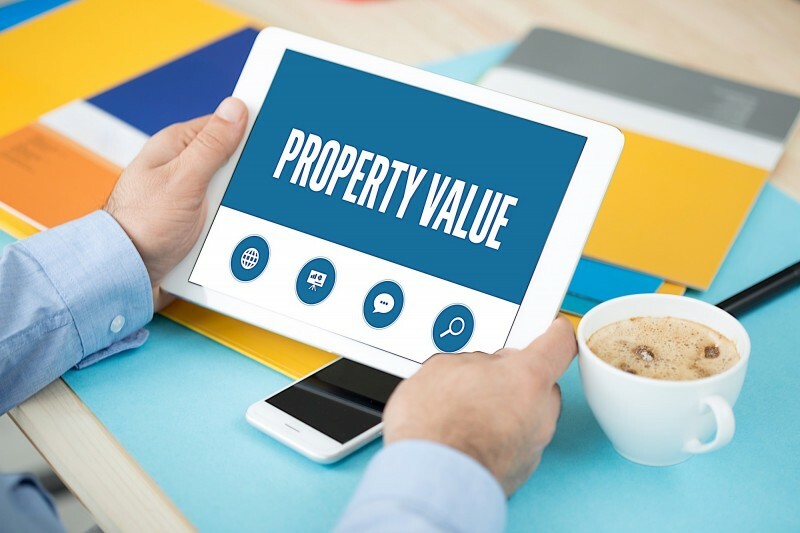 Whether choosing to utilize a property value estimator tool or make each and every calculation by hand, investors are sure to develop an appreciation for property evaluation. Property value evaluation is a critical skill that allows investors to identify the difference between a good and bad investment deal. The purchase price of a property only scratches the surface in terms of the value a property has to offer, especially in the long-run. What is one of your tried-and-true methods of calculating property value? Has a certain approach ever helped you avoid a bad investment deal? Feel free to share in the comments below.